Memorable cruise moments often involve food, particularly spectacular desserts. One of my favorite ways to end a great cruise meal is with anything chocolate. 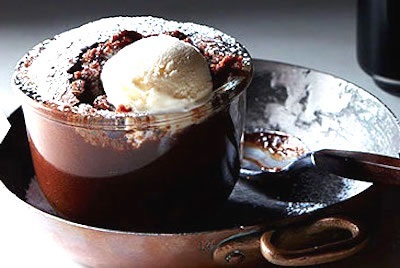 Carnival Cruise Lines, in particular, has a delicious Warm Chocolate Melting Cake. When it is listed on the menu, that is always my choice, especially if it is served with a scoop of ice cream. For those who want to try the popular sweet at home, Carnival is sharing its recipe. But, be prepared. Your family and friends might like it so much that you’ll soon be making it for more than special occasions. Or you’ll be booking a Carnival cruise where you can sit back and order the cake without having to make it yourself. Melt chocolate and butter. Mix eggs with sugar and whisk for a few minutes. Add flour. Combine egg mixture with melted chocolate and mix. Pour into individual greased molds. Bake in oven at 400 degree for 14 minutes. Sprinkle with confectioners sugar and, if desired, garnish with fresh fruit. Serve warm with ice cream. Serves 12.